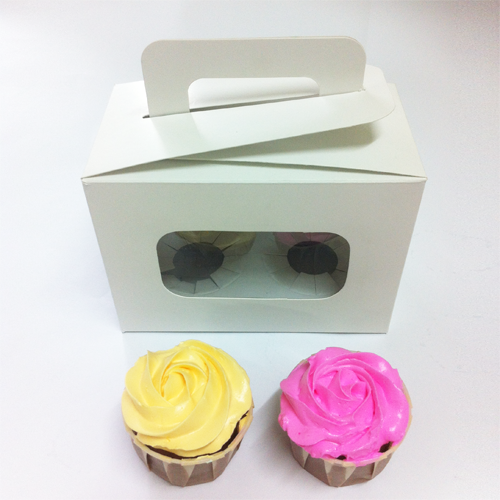 Welcome to Cheerico Cupcake Boxes in Malaysia! Our square acetate "windows" cupcake box allow the frosted tops and decorative touches on your cupcakes to peek through. It comes with a Handle hence you do not need a carry bag. Measures:15.2cm x 8.3cm x 11.1cm+5cm handle﻿. Base diameter: 60mm. Boxes come flat, easy to assemble. Our square acetate "windows" allow the frosted tops and decorative touches on your cupcakes to peek through, even when the box is closed. Each box includes an insert with recessed space to hold a standard cupcake safely in place. Easy folding assembly; great for gifts and favors as well. Ribbons and accessories are not included!